What’s in a video? Sensationalism? Evidence? Or nothing to see here? UPDATED below, here and here. It’s a bright January day on Yarlburgh Street, a 20mph road on the border of Moss Side and Whalley Range, and the rider is approaching a red traffic light at the junction with Alexandra Road, positioning themselves ready to turn right and cycling towards the bit of green paint that’s often referred to as the ‘bike box’ or ASL (advanced stop line) – technically called the Advanced Stop Zone it’s the area in front of the ASL and behind the stop line. 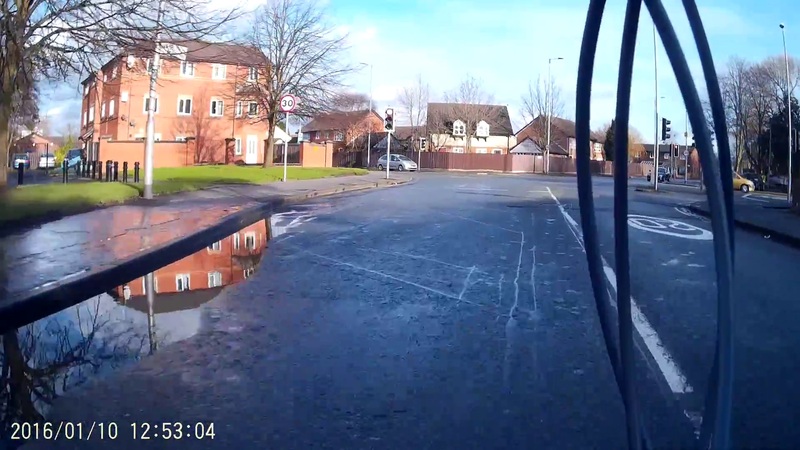 It’s a fairly typical road in urban Manchester, with worn paint, potholes, puddles and changing speed limits. The junction is also fairly typical, with its flared kerb-lines that are often insisted on in order to facilitate easier HGV movements, despite the obvious side-effect that they also facilitate the faster driving of smaller vehicles. 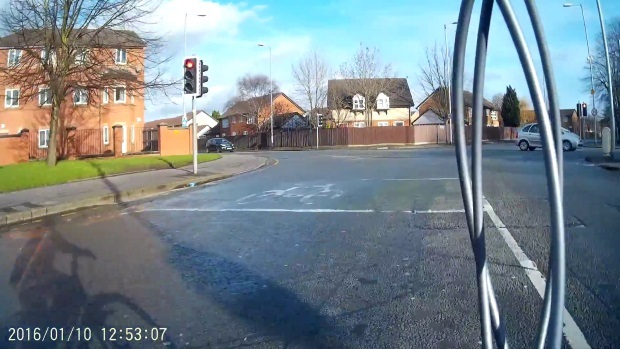 Nothing unusual so far, unless you think it’s unusual for a cyclist to stop at a red light. 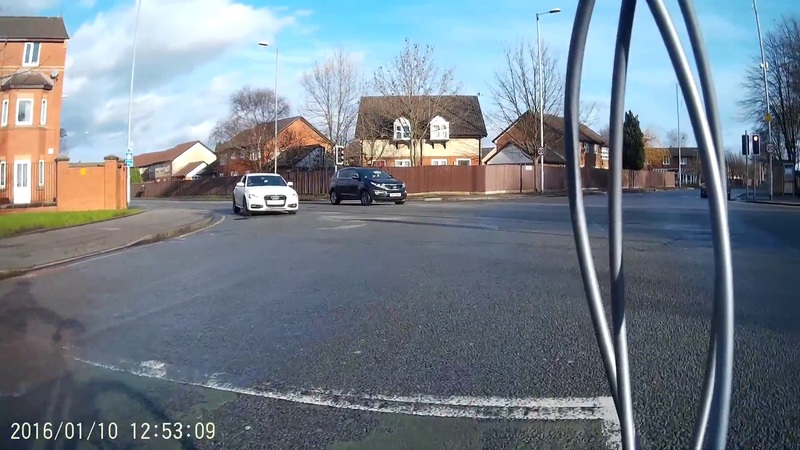 The black Kia Sportage in the top-left of the above image is about to turn right towards the rider, who is now positioned ahead of the ASL in the position that’s recommended if you’re cycling and about to make a right turn. Again, nothing unusual. Yet. Then a white Audi S4 appears. We can tell from this image that the Audi is accelerating and about to overtake the black Kia. The rider can probably hear its acceleration, and they are also likely to be aware that the lights have changed – more on that later. It’s probably best to watch the video now. Spoiler alert – the rider is not harmed. A ‘near miss‘ – or perhaps a more accurate description would be: dangerous illegal driving and a ‘near hit’. Most people would consider this to be a situation where the “standard of driving falls far below what would be expected of a competent and careful driver and it would be obvious to a competent and careful driver that driving in that way would be dangerous” – the legal definition of dangerous driving. Had the lights changed, and was the driver an ‘ambler gambler’ ? The above two images show that the lights are red in both directions – this is known as the ‘inter-green period’ and Manchester City Council will have records to confirm the length of this phase. The image below shows the lights changing again. This is the end of the inter-green period and some simple analysis of the video when considered with the junction’s timing details would provide specific information concerning the status of the light that the Audi was driven through with respect to the vehicle’s position. 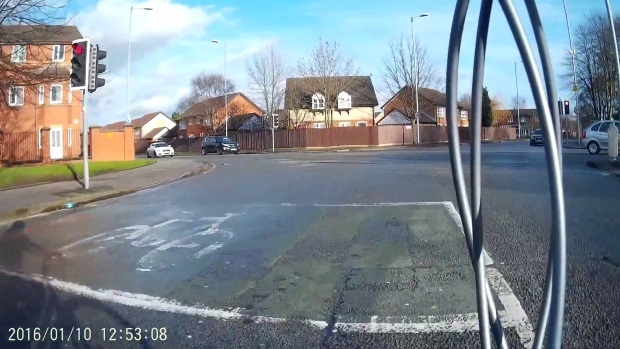 So that’s what’s in this video – a scary incident featuring an extremely graphic example of dangerous driving where fortunately, or perhaps miraculously, nobody was injured. But what difference does, or can, it make? 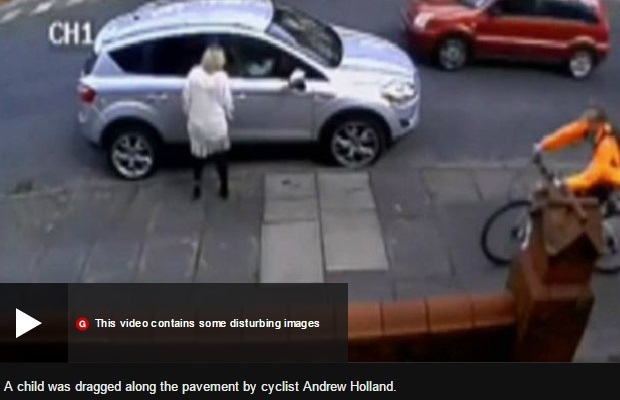 These headlines make no mention of any inappropriate action by the driver, and when seen without the video or rest of the article they could be interpreted as: cyclists are in danger and they cause danger and isn’t it fortunate that the (skilled) driver was able to swerve onto the wrong side of the road to narrowly avoid hitting the (unskilled and lucky, so should be grateful) cyclist. Does this choice of language make cycling appear more dangerous than it is? and if so, is it done deliberately? We’ll leave that for you to decide and for people like @beztweets to analyse more thoroughly. 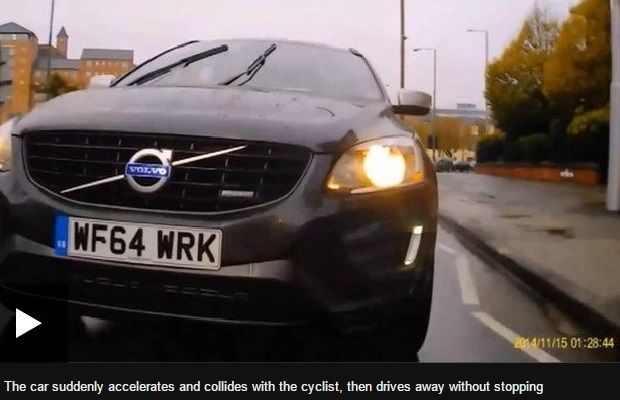 Highlighting how the language used in the first report can influence future reporting and discussions, the cycling news website road.cc soon followed up with a less sensational headline, but quoting the original one and still focussed on the driver’s avoiding rather than endangering action: Video: Driver “swerves to avoid cyclist” – what do you think? 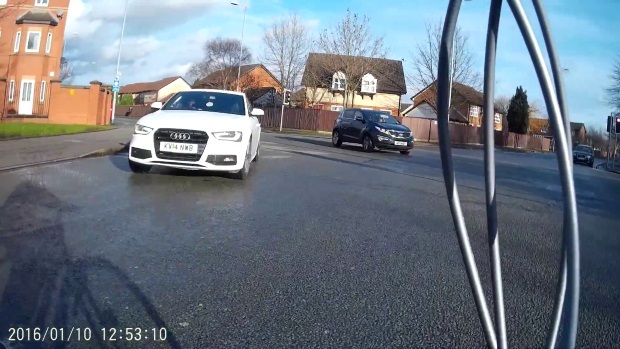 There seems to be a consistent, concerted effort to use language that absolves drivers of any responsibility, whilst also using language that makes cyclists appear to be incompetent and/or vicious, and make cycling appear to be dangerous. It’s as though the media are anti-cycling and pro-motoring, which might be expected from a tabloid rag that receives much of its funding from the auto-industry – but from the BBC? Sensationalism spoiler: Despite the rider in the first of these stories being described as a callous ‘hit-and-run’ cyclist who swore then rode off, he hung around long enough for the toddler’s mother to take a photo on her mobile phone, and by the day after the accident he had already contacted the police. In a later report it was claimed he did stop and apologise before being driven away in a car, while his parents described him as a quiet lad who’d never been in trouble before and suggested that the incident had ‘destroyed his life’ – so no winners in this story, unless you’re getting advert revenue from your media. The most important question is: what can be done to prevent this type of driving in future? 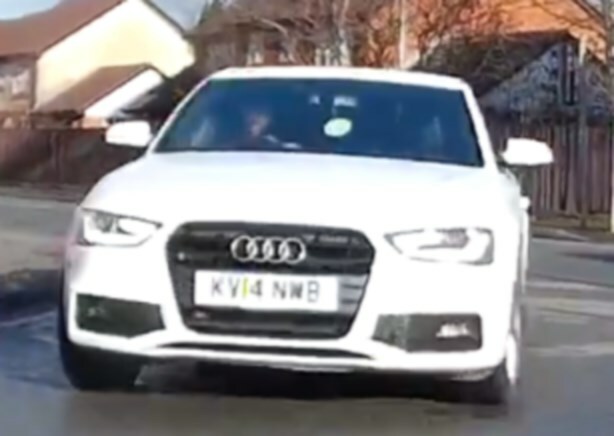 We alerted GMPTraffic to the video of the white Audi by email and on twitter. Unfortunately it was over fourteen days from the incident, which limits the options available to them. GMP Traffic have initiated some action which is still ongoing, so we’ll update this post again once that’s been completed. Reporting this incident has highlighted the need for people to promptly report serious motoring incidents to the police – we were told that if they had known of this video within fourteen days of the incident then they would have tried to charge the driver. 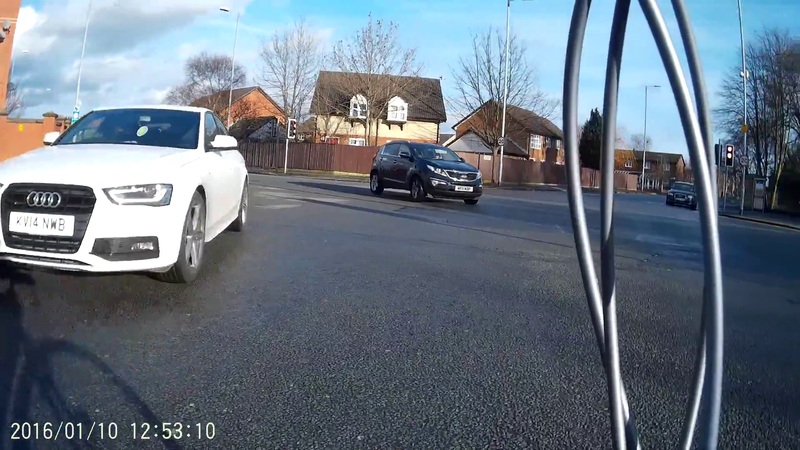 The issue of funding and resource management is often cited by GMP Traffic as something that prevents them from investigating and enforcing many motoring offences, so we’ll continue to lobby GMPCC for more funding and work with other cycling safety advocates on a national online reporting system.